Home People Robert Lo’s Mabul Water Bungalows House Reef – Artificially Awesome! If house reefs are considered the playground of marine life, then the house reef at the Mabul Water Bungalows is the Disneyland of all things aquatic. The brainchild of entrepreneur Robert Lo, the house reef at this tranquil island resort is a result of Lo’s hard work, dedication and above all, passion. The reef came to life some 15 years ago, after Lo surveyed the sand-bottom site, having been damaged by fish-bombing activities. “I asked myself, ‘How would I be able to attract the marine life to this area and build something from nothing?’ ” he recalls. After spending a significant amount of time studying the surrounding marine life and gauging what structures would best suit the reef, Lo went to work. Fast forward 15 years and some RM 1,200,000 later, the Mabul Water Bungalows house reef has become a Mabul must-see for all divers. 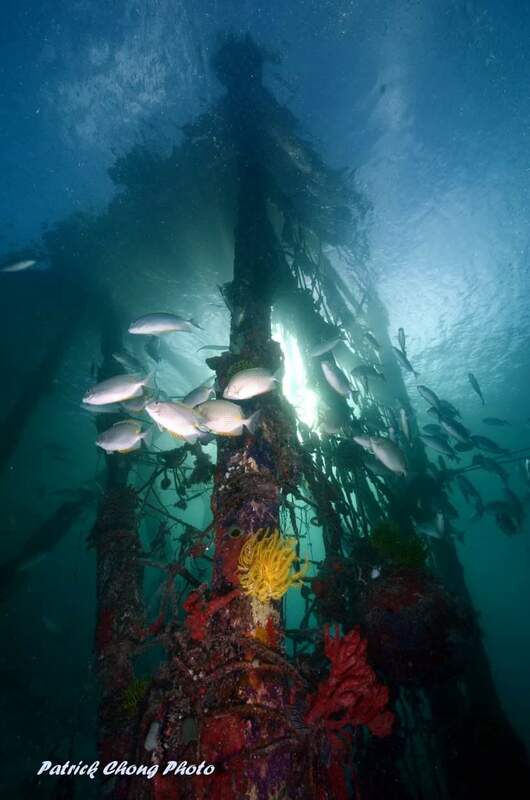 Today, the reef is teeming with marine life, swooping in and out of the Belian-wood structures secured with bolt nuts and some taking sanctuary in reef balls. Slowly but surely, both soft and hard corals are making their presence felt, creating a haven for the myriad of marine life found here. Divers encounter massive school of Jackfish numbering by the thousands swimming around the house reef, resident giant groupers weighing anywhere from 30 to 100 kg, turtles, barracudas, stingrays, crocodile fishes and bumphead fishes to name a few. Even the orange and black Dragonet has been spotted – which is quite a feat considering it’s roughly as big as a grain of rice! But Lo lets in on a little secret in attracting marine life to the reef: a little vibrating action. “We have these long rods you might come across in the reef and although we humans cannot feel it, it lets off a vibration which the marine life can sense and this attracts them. This is a technology developed by the Japanese some 12 years ago and has been said to even attract whale sharks,” he reveals. Lo shares that the reef is truly a combined effort and a testament of passion and dedication. “We’ve received a few volunteer groups who have contributed to the success of the reef today. 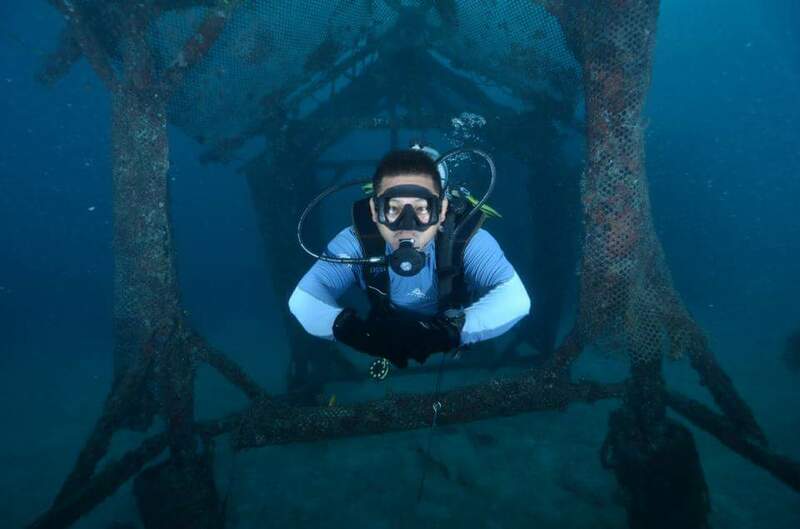 There was a group of divers from Thailand who helped with constructing the reef some ten years ago and another group from UiTM (a local university) who planted artificial seaweed and seagrass nine years ago. Thanks to their generosity, the reef has become what it is today,” Lo says. The local community also plays a part in the success of the reef and simultaneously benefit from their efforts. 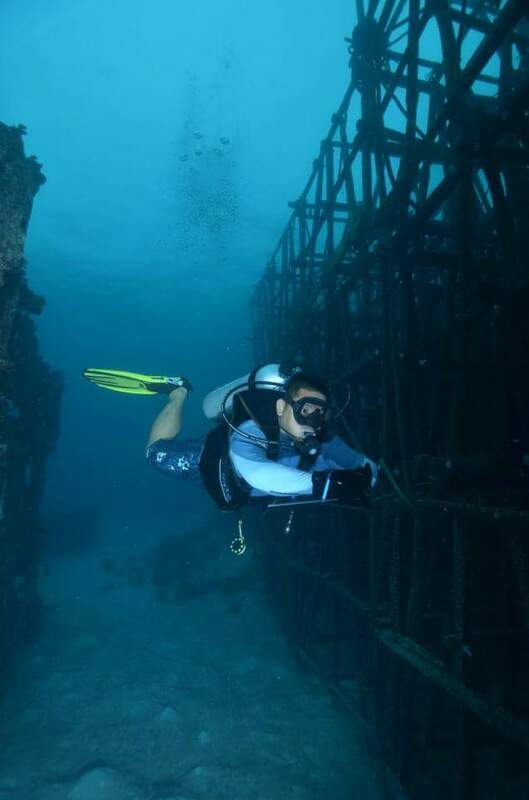 The village folk are paid RM15 for each cubicle built, which is used to create artificial reefs. But as it is with all success stories, the Mabul Water Bungalows house reef faces its fair share of challenges. “We have regular weekly rubbish clean-up at the reef. Although the resort practices responsible waste disposal, the tide brings in rubbish from other areas and the only thing we can do is conduct regular clean-ups. However, it is my belief that this problem can be minimized, if not solved, with education. The local residents need to be informed of proper disposal methods and learn about the consequence of throwing their garbage mindlessly into the sea,” Lo shares. Apart from that, there is also the issue of manpower in terms of assembling and maintaining the reef. “Currently, I have to rely on the divemasters to assist me with this and the only free time they have are between dives or on their days off. However, I do not want to exhaust my staff and risk their safety. 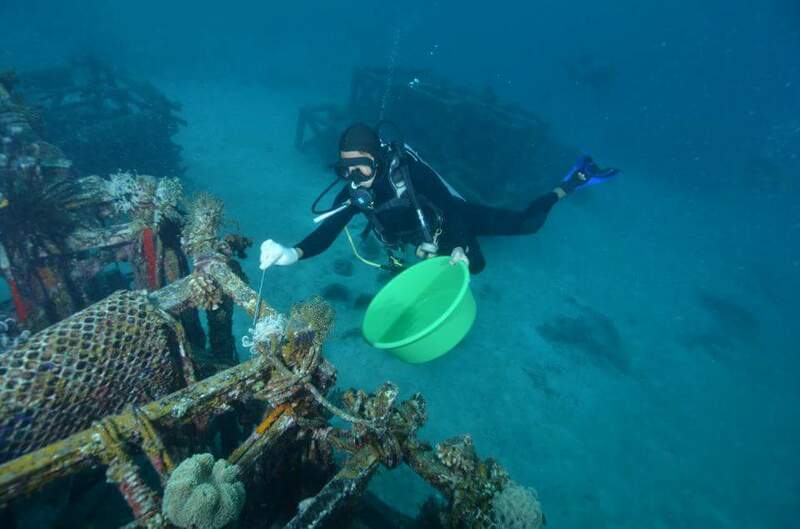 So sometimes we do not have the luxury of working on the reef as often as we’d like to,” he adds. Rope network under the house jetty teeming with life. 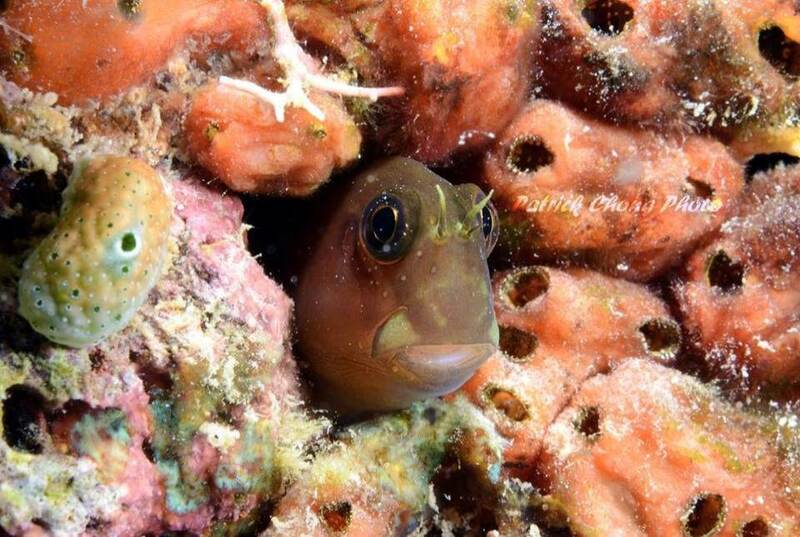 This blenny is among the new residents among the artificial reef. So what lies for the future of the Mabul Water Bungalows house reef? Lo says that expansion is definitely in the plans as well as improving the aesthetic value of the reef by using statues instead of standard pyramids and cubes. “Like the pyramids and cubes, the statues will act as a base for corals to form and attract more marine life. On top of that, they also make the reef look more interesting,” he explains. 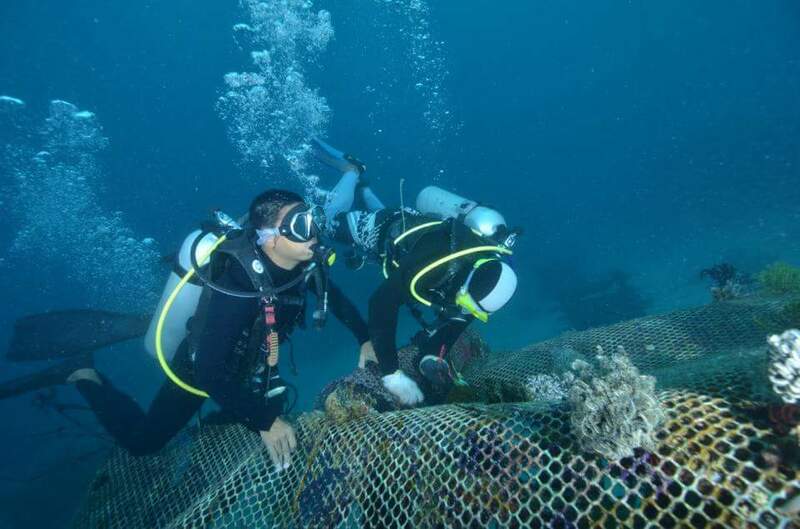 Mabul Marine Week, which takes place annually, will continue to be a platform for education and conservation in which participants help clean up the reef and plant more corals while discovering and learning more about the marine environment. Over the years, Robert Lo has proven that with a little determination, plenty of passion and a dose of vision, it’s always possible to turn ‘nothing’ into truly ‘something’. Words by Melissa Leong and images by Patrick Chong, for Asia Diving Vacation.